At Papplewick, education in art is seen as a time in the week when pupils are encouraged to extend not only their powers of creativity, imagination and awareness of the visual world, but also as an opportunity to develop their mental powers. We follow a structured teaching programme which builds upon their skills as they progress through the school. We encourage an appreciation of different cultures and artists throughout history. Papplewick has a well equipped art room with additional facilities for both ceramics and printmaking. 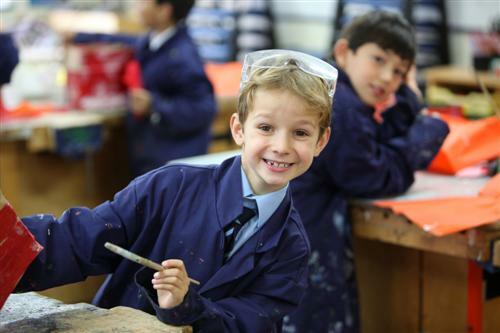 Boys showing potential are invited to attend extra art activities and are expected to work with commitment. They will compile an extensive portfolio in preparation for taking an Art Scholarship to their chosen senior schools. Serious applicants have a truly demanding and time consuming task but also have much to gain. Emphasis is placed upon the progress of all boys throughout the school, rather than just on scholarships although we have enjoyed considerable success in recent years. The school has a number of large panels which have been the result of larger group projects. These can be seen in different locations around the school and there is an annual art show at the end of the Lent term in which we celebrate the achievements of the whole school. The Music Department aims to develop and nurture the musical talents of all our boys and foster a love and enjoyment for music-making of all styles and genres. There are a variety of performance opportunities throughout the year, and all boys are encouraged to be involved. There is a strong tradition of vocal music, with our four part Chapel Choir performing at weekly Chapel services, a secular Second Choir, a Junior Choir, and the performance of various musicals. Three quarters of the boys learn a musical instrument and there is a junior brass ensemble, string ensemble, wind band, jazz collective, scholars' ensemble and chamber orchestra. The boys have enjoyed much success in their Associated Board exams and the more accomplished have been selected to play in the IAPS orchestra. Our electric guitarists and rock drummers are examined by the Trinity London examination board, and bands perform regularly. We are fortunate in having a purpose built Music School which consists of a large teaching room, a fully equipped Music Technology suite with 20 Apple Mac computers and midi keyboards with notation and sequencing software, twelve practice rooms all with new Yamaha or Weber pianos, a designated drum room, and a library. There is a two manual and pedal pipe organ in the Chapel and a Yamaha grand piano in the school hall. All boys receive class music lessons with a considerable emphasis on Music Technology in Years 5-8. Drama begins in the Lower school where boys are encouraged to listen to each other and work together to a common goal. They take part in poetry reciting and class plays as well as variety shows which blend public speaking, music and group work. Throughout the school, each year every year group takes part in a stage play as well as having weekly drama lessons in the Michaelmas and Lent terms to foster the work begun in the Lower school. All take part in a Spring Arts Festival at Easter. The senior boys often do plays in chapel as well as put on full musicals each Christmas. This has become the greatest team sport as most productions have large casts.